Here's another personal & kinda fresh blog entry!!! Oha. Haha. 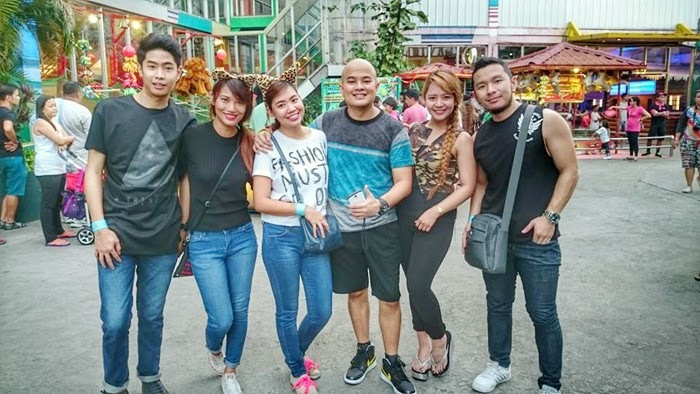 Last weekend, the Laiya gang got together for an impromptu tambay at Star City. My friend Marc Solis (remember Magic Temple or Koolitz? Hehe) had a radio guesting at DZRH inside the amusement park and he got us free tickets! I just came home from Camsur that day but Nico really wanted to see them (clingy muuuuch) so push na! I also wanted to go because I have never, ever been to Star City. Eveeer. I think it's also an indirect result of my traumatic experience at Boom na Boom when I was a kid. Well, it was more embarassing than traumatic. Haha. I had so many humiliating eksenas like getting lost alone inside the park for hours, screaming while crying na pang FAMAS when my little bro's pants got caught sa net in the pool ball. Award talaga. Fast forward to now, my parents and relatives are still not over it. I think they will still bring those stories up until my funeral. Or after. Okay, morbid na naman. Anywaaaay! 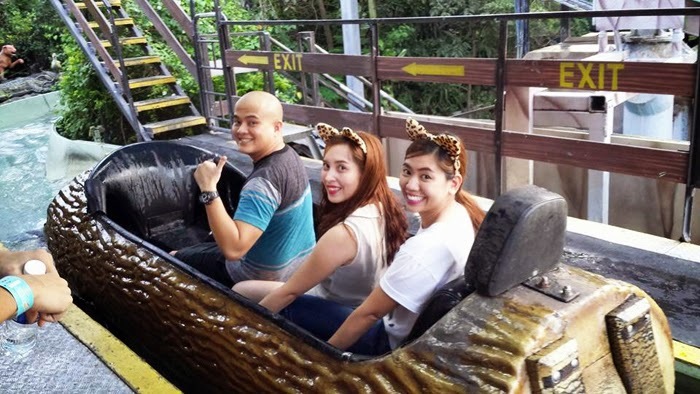 The gang wanted to try and scare ourselves by experiencing Gabi ng Lagim. Sorry, natatawa ako. Hahaha. It's the perfect example of the quote, "it failed so hard that it won". Here are photos and more kwentos! Nico and I came later than the rest because we had to catch up on sleep. Got there at around 4pm. 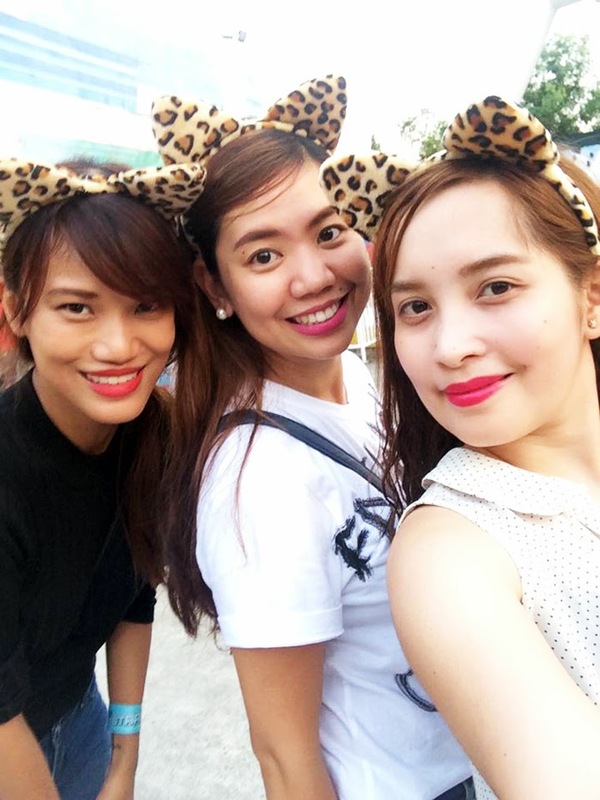 Disneyland sa laki. Joke. Hehe. Our first meal for the day! Laman tiyan din yan. A little pricey for P170. It was a little sad that only 3 of us in the group were game to try out the different rides. I skipped on some because Nico didn't want to go with me! Such a weakling. Haha jokeeee. For our first group ride, we tried PIRATE ADVENTURE! ..dreams & imagination shattered. Haha. it was the longest 2 minutes of my life. Haha. The group decided to try the smaller horror house. Pang kids daw. Okaaay. It has been ages since I last did this. Nico and I intentionally wore black so we could camouflage inside! Success! Black light eh so malas ng mga nakawhite a.k.a. Ate & Meg. Haha. It was super tolerable and kayang kaya. The only "human" ghosts were placed near the entrance and 2 pcs lang sila. Haha. It's mostly mechanical. So no biggie. Mejo kagulat lang ng very light. My favorite attraction of them all! I could just spend the whole day here lining up ng paulit-ulit. EK's jungle log jam is more fun but this will do. Hehe. Kiber na even though may minor baha situation inside the log. Lol. Ride or die eeeh. Never ever ever. Marc & Cheska's support group. Haha. Byeeee! 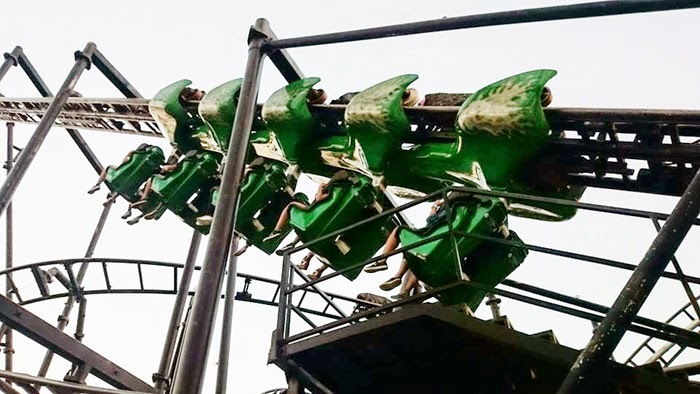 This ride has 2 loops but keri naman daw. I wanted to do games but they were not up for it. Ako lang may gusto. Haha. Quick OOTD! Love my new sweater from NAVA, plaid bag from Suiteblanco and my favorite Converse! 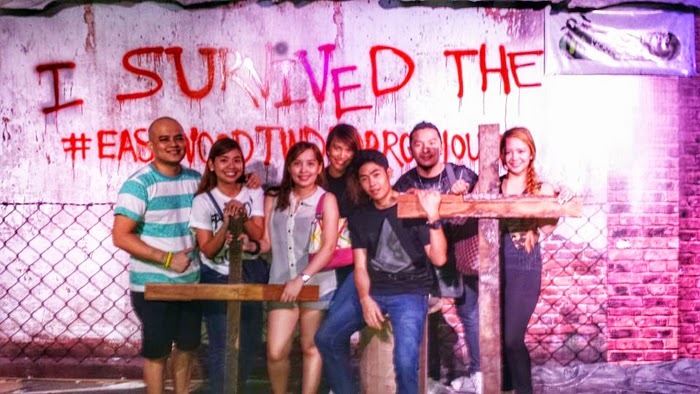 We then decided to try na the bigger horror house: Gabi ng Lagim! Lakas maka Shake, Rattle & Roll. Ma shake, rattle & magroll kaya kami sa takot??? Super serious Pax (while we were all walking in the dark): Guys, guys wag kayo maiingay! Maririnig nila tayo! We have to strategize. Strategize!!! Whiplash levels. Haha! Parang space shuttle na kulang ng 5 na paligo. It was so fast I had a headache after. But, sulit! And it was so much fun watching Nico transform from cool to drool. Whatever that means! Wahaha. My favorite part... SNACK TIME! Finished a box of Potato Corner fries & XL Ice Scramble. Yuuuum. 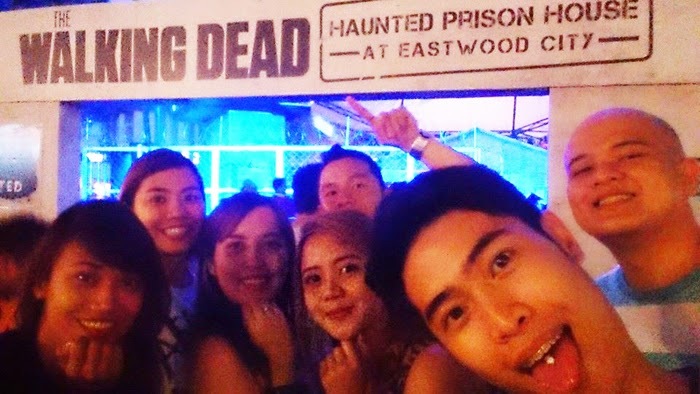 It was just a little past 6pm and we felt super bitin, so we all agreed to go to Eastwood to try The Walking Dead Hunted Prison Horror House. Nico and I were like excited little kids because we are huge TWD fans!!! It will run until November 9 from 6pm to 11pm! But when we got there, the line was like pila sa BPI on Mondays. In short, no chance at all. we observed nalang and took photos. sa labas palang scary na! We didn't want to brave the super long queue, so we ended up eating dinner nalang at Dencios. Not the best meal but I finished a whole plate of green mango so bawi na din. Yey. We finished eating at around 10 before 10. We passed by the horror house again and no line na! GAMETIME. out hearts were literally pounding the whole time we were in line. Worth it the P100 entrance fee! Feeling nasa prison and Terminus na din kami. Heehee. Group yourselves into 6 ang policy dito. In our case, 7. Kawawa naman kasi maiiwan or mahihiwalay haha! Very encouraging din si Kuya manning the door. He said someone had a heart attack nung opening. Joke ba yun? Haha. Photos and videos are not allowed inside so I'll just share with you how we survived. We went inside in one line but on our first turn ayun na, nag rumble na!!! Haha. I think that's where I got the huge bruise on my left leg. Lol. The hallways are soooo narrow and there's a zombie in every corner, in every turn. Heart attack levels! They don't touch you naman so it's okay. They would chase you lang. Bet niyo? Haha. My winning strategy? Position yourself sa 2nd or 3rd from the front so you could run na habang di pa nakaka-warmup the zombies! Haha. Mini Outbreak Manila sha. Haha. Scary the part where there are so many zombies locked up inside cells. Don't worry, they won't be able to reach you naman. And that's where it all became a blur. Haha. I just found myself running and running and pushing Cheska who's infront of me. Haha! As in like tulak sa World Cup stampede. Lol. When we got outside, I was panting. Like I just came from a marathon or boxing session. When you think of it, nice workout sha. Haha. We did it!!! I want to go to Star City, it looks fun.